The countdown is on: only a few days until we’re streaming live on Facebook and blogging from the 22nd International AIDS Conference (AIDS 2018) in Amsterdam. Starting on the first day of the conference (July 23) , our team will be on-site to interview federal researchers and experts who will break down research news and scientific advances in HIV prevention and treatment. We’ll also take you behind-the-scenes and show you the Global Village and other unique and exciting aspects of the conference. Facebook Live Streams - We’ll be live streaming interviews and daily recaps throughout the week. Stay tuned for our updated schedule. Facebook Messenger Chatbot - We just launched our first chatbot to give our Facebook community real-time updates from the conference. Subscribe today to get conference highlights and news delivered to your Messenger app. Social Media - As always, we’ll be posting on Facebook, Twitter, and Instagram. In addition to frequent posts, we’ll also be sharing content via Instagram Stories. Email Alerts - Prefer email over social media? 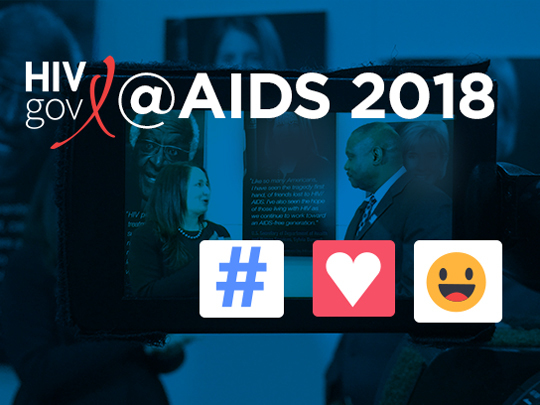 We’ve created a special email list just for AIDS 2018. New and existing subscribers can opt in to the new list to receive alerts when we’re going live on Facebook and will be the first ones to be alerted of new blog posts and updates. Daily Recap Blog Posts - Each day our team will synthesize conference updates and research findings in a blog post. Check back here next week or choose one of the options above: we’ll let you know when the blog posts are live. Tell us: what are you most interested in learning about during AIDS 2018? Let us know via Facebook or Twitter.